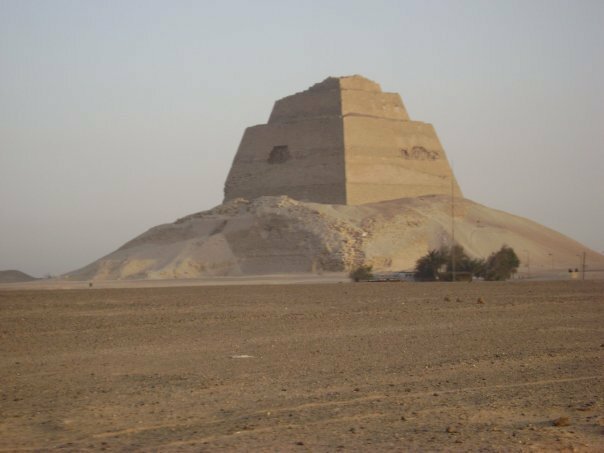 We had heard about the lost pyramid of Meidum, the disastrous and forgotten precursor to the Great Pyramid of Giza. We wanted to see the failure so it went on our bucket list. After traveling for over two hours in rural Egypt on a journey that was only supposed to take one, we began to realize just how big of a “failure” the pyramid of Meidum really was. Meidum was the last stop on a day dedicated to seeing all the pyramid sights on our list, and we never anticipated it would take so long to get there, nor that it would be so difficult to find. We were lucky to have such a loyal and perseverant cab driver. My brother Terrence, his friend Lisa and I had been chauffeured all day long around Cairo and its surrounding pyramids beginning at 6 a.m. that morning, enlisting the services of a local taxi driver we met the day before. We spent the early morning wandering the wonders at Giza– its pyramids, temples and sphinx whose construction by an African civilization 4,500 years ago is still hard to explain. We also spent the morning trying to avoid the hoards of tourists as they inevitably descended upon the desert monuments. 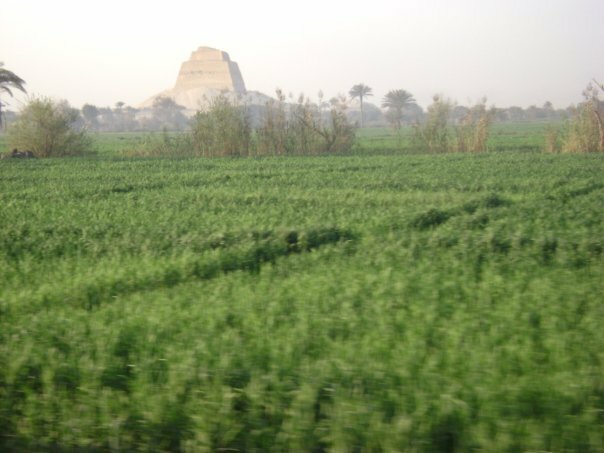 While once a beautifully isolated World Wonder, the Great Pyramid’s doorstep is now encroached by Cairo’s expanding urbanism and its estimated 18 million people- along with the tourists that such urban proximity often brings. With these numbers, Cairo was hot, crowded and dusty. Avoiding the onslaught of gigantic tour groups and men on camels looking for paid photo-ops left us overheated and overwhelmed. Our legs ached and our lungs choked on smog. It was the idea of escaping this urbanism for a short while that attracted us to the rural and relatively unknown Meidum. Meidum is about 100 km south of Cairo, so we saved it for last given our uncertainty at how long it would take to get there. That was a really lucky decision. The trip took us between four and five hours. Following Giza and the equally crowded pyramids at Saqqara, we departed Cairo around 2 p.m., leaving the gasoline-soaked air, the traffic-jammed highways and the city with one of the largest population densities in the world- more than 50,000 per square km.- behind. We went searching for the failed test model of Egypt’s engineering superstructures. Lisa read the story in her Lonely Planet guidebook. 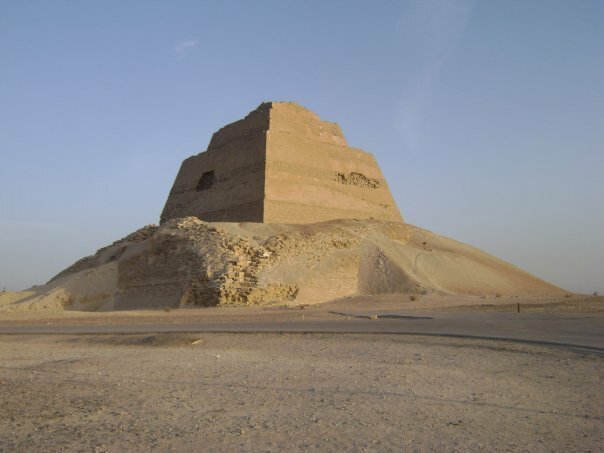 Known as the “first true pyramid,” Meidum was built under the reign of Pharaoh Sneferu (2613-2589 B.C.) who originally commissioned it as a step pyramid, but later ordered his workers to pack the steps with stones and encase the entire structure in limestone, giving it the smooth sides we see today at Giza. Engineering flaws led to the limestone shell’s collapse at an unknown date. Left among its rubble, all that remains standing is the pyramid’s inner core. Many researchers believe the project collapsed during construction, subsequently abandoned only to teach the pharaoh’s architects how to build more successful, stable structures like the Bent and Red Pyramid at Dahshur. Eventually these pyramids would serve as models, and lessons, for the Great Pyramid of Giza, one of the Seven Wonders of the Ancient World. But the Bent, Red and Giza pyramids were all successes. We wanted to see the failure that inspired them. Our little black and white cab sped down the open road as the scenery began to look more and more like the arid, empty desert that is rural Egypt. The taxi did not have air conditioning, considered a luxury in this developing country, so we rolled down our windows and let the breeze whirl through the interior. Everything was quiet except for our voices attempting to make small talk with our driver. “Do you live in Cairo? Are you married? How many children do you have? Have you ever been to Meidum?” His English was minimal, so we kept our questions simple. The drive was peaceful, unlike the constant noise and smog and claustrophobia of Cairo. We thought we were making good time and our map would easily lead the way once we were a little closer to the pyramid’s site. We were wrong. About an hour into the road trip our car approached a little village. The lack of road signs left our map difficult to decipher, and our driver stopped to ask the locals for directions. I couldn’t help but notice the lack of infrastructure in our location. The roads were no more than dirt paths, mud-brick houses were crumbling and villagers appeared to be washing themselves in river water polluted by sewage. Egypt has the second largest economy in the Arab world, but you would think it had the smallest given the quality of life of the majority of its population. Given the numerous amount of people living in this community, not a single one could tell us exactly where to find Meidum. In fact, they all gave us different directions. We stopped well over four times, backtracking our direction at least twice. After two hours on the road, we began to feel hopelessly lost, and the possibility we would not find our destination made the journey feel more like a failure than the pyramid. Leaving behind the village to again peruse the desert wasteland, we considering giving up and attempting to make our way back to Cairo. We stopped by one last lonely farmer driving his donkey along the path, truly isolated on his journey home. He pointed just a little ways down the road, muttering something in Arabic. As we continued, the desert landscape faded into something more lush: tall reed grass and palm trees. And there it was. Just a mile or two to our right, beyond the grass and once more planted upon a bed of desert sand like Giza, stood the pyramid we had been searching for. The beauty and isolation of such a forgotten monument made the hours wasted in the hot leather cab all worth it. The original limestone casing fallen around the core looked like a mound of desert jello, and the inner structure towered high above us, revealing three large steps rising 213 feet. It was incredible to imagine how such enormous blocks and large sheaths of stone could be transported and raised and worked, and to imagine what a disappointment the failure of this work must have been. In commissioning such an edifice Sneferu envisioned nothing but grandeur, and I wondered how he would feel knowing his name is still attached to this dilapidated sandcastle. No wonder it’s in the middle of nowhere, I thought. The climb up the surrounding rubble was strenuous, as well as the stairs inside leading to the burial chamber. The stairway was like a long, dark mining tunnel only big enough for you to crouch your way through. It opened up into a very small room in the center of the pyramid, where the sarcophagus was typically laid to rest. But nobody was ever actually buried in the Meidum pyramid, and the two stelae inside remain unmarked, furthering the idea that it was abandoned mid-construction. No pharaoh would ever put their inscription on this failure, for fear it would be their legacy. Our stay inside the pyramid was short and rushed, as by that time it was nearing dusk. About 20 minutes after our arrival, we were already on our way back to the city, leaving the failure alone among its ruins. Just a little less than a year after we left Egypt, the country erupted into the biggest protests of the country’s history, forcing the 30-year dictator Hosni Mubarak to flee to a seaside resort and abdicate all power. His trial for ordering the killing of peaceful protesters is still ongoing. Mubarak was one of three oppressive dictators that have plagued Egypt over the 59 years it has existed as an independent republic. These dictators left the country’s infrastructure, and a majority of its population, suffering like the collapsed outer shell once designed to make Meidum so glorious. Sneferu’s architects learned from their mistakes, and did not repeat them. Watching the recent events in Egypt unfold on Al Jazeera, my mind keeps going back to the original failed experiment, nearly 5,000 years ago, which paved the way for one of the Seven Wonders of the Ancient World. With Egypt’s newest failure so close behind, the lessons learned are still very uncertain. But if current events are anything like the past, Mubarak could very well become Egypt’s 21st-century Meidum. Do you want to read more about Egypt? Check out Discovering Egypt with Desert Divers Dahab or Twenty Six Hours in Alexandria, Egypt. I have been unaware of this pyramid until I read your post.